I am getting to complete my Senior level rating which is the last thing I'm missing for my level 3, when I submit for my Level 3 how high up does it have to go i.e. does it only need to make it to my squadron commander or does it need to go up the the wing commanders desk. f.y.i. there are no groups in my wing. Levels III, IV, and V are approved at the wing level. All I know is that when my wing commander approves the level V it is recorded immediately in e-services. Does he also have region level rights? Yes Bob, but the previous wing commander didn't and got the same results. My Wilson number was only issued after someone at Region HQ approved it. No issue, just my experience from a month ago. I have sent my paper work in for my level 3 to be approved 5 months ago. have inquired of my commander and the commander has resent it multiple times. not sure what to do. I dont want to jump the chain of command, but really frustrated. any suggestions? Check Eservices or have your PDO check. IIRC, when I submitted my Level V last year, it was through Eservices. No paper involved. +1 - if you sent paper, it's probably been round-filed. If it went through eservices, someone is ignoring their queue. I don't think it takes a Region commander to approve level 5. It DOES take the Region commander to approve the LTC promotion that comes afterwards. 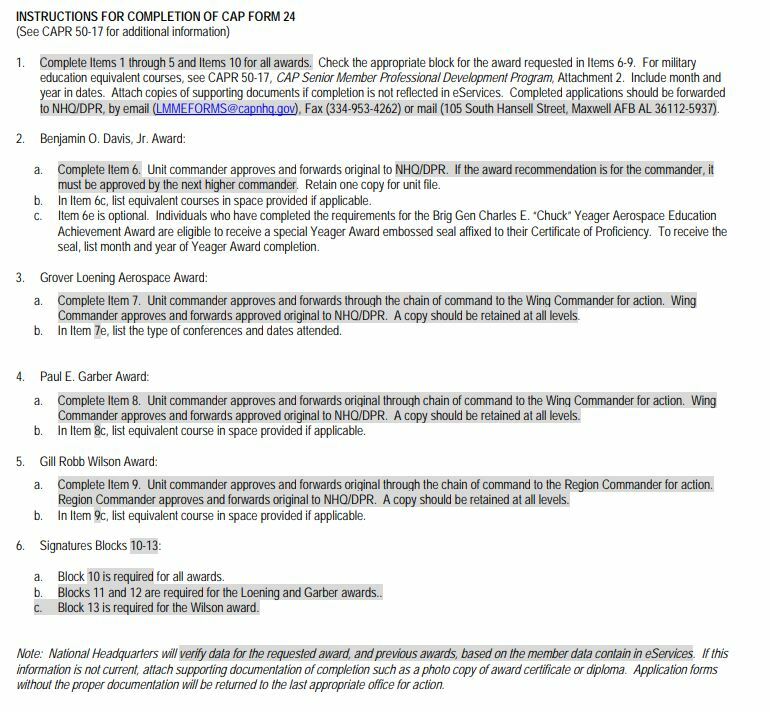 Region CC or designate must approve the Wilson Award / Level V.
CAP Guy - Not sure why you sent paper. Please do it via eServices. It does not take anywhere near as long and no one can claim that it was "lost", either. All your records will show up there anyways so it should be a simple matter for your PDO to verify that you met all the Level 3 requirements and click the button which will generate an entry in you squadron commander's queue. From there it goes to Group - if you are in a Wing that has Groups - and the Wing. That's as far as it goes for Level 3. Which makes even more sense now that Level 5 is required for O5. Only thing that doesn't line up now is that you need a national school for it. Just like you need a region school for the wing promotion that comes before it. I have look into doing it in eservices, but cant find it. possibly I dont have rights to It. My PD guy couldnt find it either. Have to have CC or PDO rights.